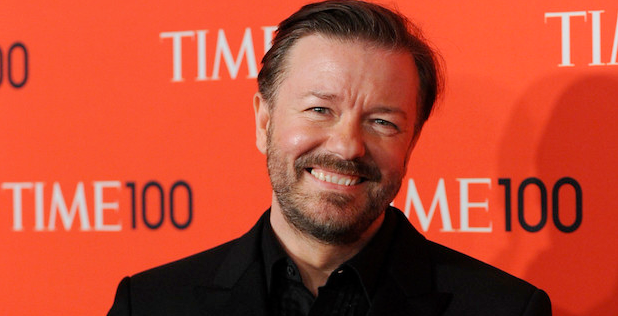 "I can’t wait for Humanity to air so I can start all over again on a brand-new show," Gervais boasted. In case you haven't noticed, Netflix is investing major amounts of money into stand-up comedy specials. Last year they inked a $100 million dollar deal with Jerry Seinfeld, and signed similar deals with Dave Chappelle, Chris Rock and Amy Schumer. Gervais is no exception. Although, Gervais really doesn't need the money. Soon after he signed off his upcoming specials with Netflix, he took a job with XM Radio again. Making him the highest paid UK radio presenter in the world. Not only are they releasing a second one hour special from the UK comedian named "Humanity" but they have also have bought the rights to the cheeky comedian's third (untitled/unwritten/unfilmed) comedy special and have picked up several other projects including The Office spinoff David Brent: Life on the Road. "Stand-up is my new favorite passion now, so it’s an absolute thrill to tour hundreds of wonderful cities and then be able to have it stream on the greatest platform in the world." As you can tell from the clip above, Ricky has had a blast returning to stand up comedy. In a recent interview with Jimmy Fallon on the Tonight Show, the UK comedian shares a story about chatting with Seinfeld about doing stand up. Jerry apparent'y can't wrap his mind around Ricky and Chris Rock wanting to put their efforts towards creating television shows and films when they could be doing stand up full time. ▶︎ LISTEN NOW: RAMON RIVAS II TALKS ABOUT THE TAMIR RICE CASE, THE VIBE IN CLEVELAND AFTER THE OFFICERS WERE ACQUITTED AND WHAT YOU CAN DO TO PROMOTE CHANGE IN YOUR COMMUNITY. Ricky went on to tell Jimmy, "I agree with Jerry now … now it comes first. I can't wait to do another tour." Followed by, "'I want to call myself a stand-up now, I don't want to call myself a comedian or writer-director. " You can look for Gervais's new special "Humanity" to be streaming on Netflix within the first quarter of 2018.